The Paper Players have a great challenge going on this week! 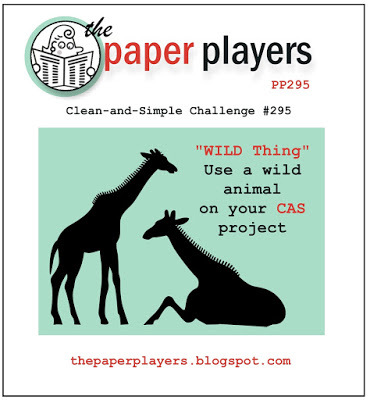 The theme is Wild Thing and your project must use a wild animal. I was excited to pull out a couple of old favourites. One is The Wilderness Awaits stamp set, which is carried over in the new Annual Catalogue, and one is the Go Wild Designer Series Paper Stack, which retires after May 31. 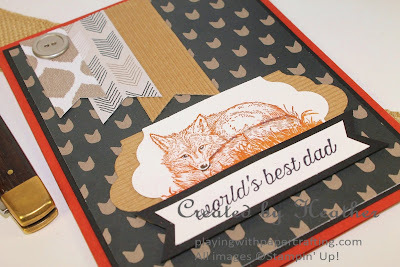 I love that adorable little fox image that is part of The Wilderness Awaits stamp set, and I thought I could make the whole card masculine enough that a cute little fox wouldn't be too out of place on a Father's Day card. I was wishing I could get my hands on the Copper Stampin' Emboss Powder* that will be new with the new Annual Catalogue, because I bet the fox would look amazing embossed in copper, but I shall just have to wait, like all of you, for June 1st. As it was, I stamped him in Cajun Craze with a little Basic Black thrown in for accent and some Hello Honey on the grass. 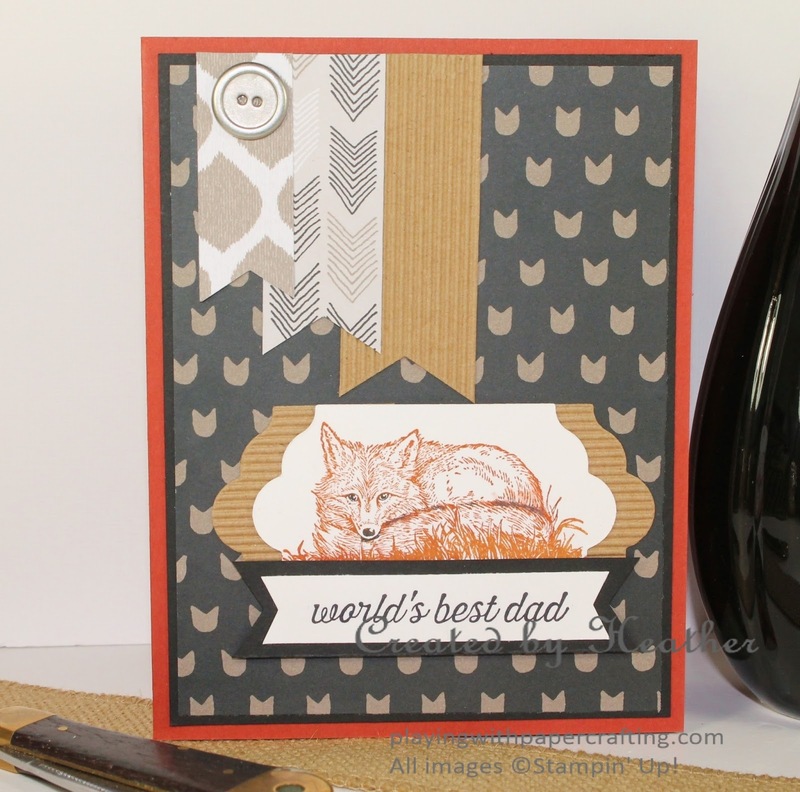 The Hello Honey and Basic Black were added using Stampin' Write Markers. Don't you love all the animal print papers that are part of the Go Wild Designer Series Paper Stack? 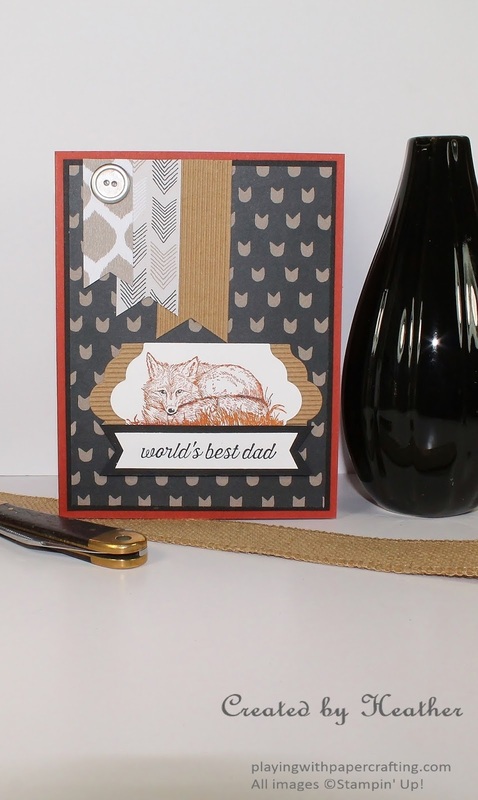 They are super for any masculine projects you have. If you like them better order them soon before supplies run out. And while you're at it, better pick up a couple packs of the Kraft & White Corrugated Paper, which I seriously don't know how I'm going to live without. I've used it in this project to add texture. The sentiment is from the Going Global stamp set, which also retires after May 31. This is another great masculine stamp set, and you know how hard it is to get enough of those.I used the Banner Triple Punch to get the flag ends in all the vertical banners, and the Basic Black backing for the sentiment. But because the Whisper White sentiment panel is so narrow, it was easier to slip it into the Banner Punch (which is different than the Banner Triple Punch) from the top and add the notches to both ends. The Banner Punch is retiring as well and is 30% off right now. Thanks for dropping by today! Head back here tomorrow for a new As You See It Challenge!